Right now at Cell Pack Solutions, we are offering a fantastic deal on our Duracell GoEasy chargers. 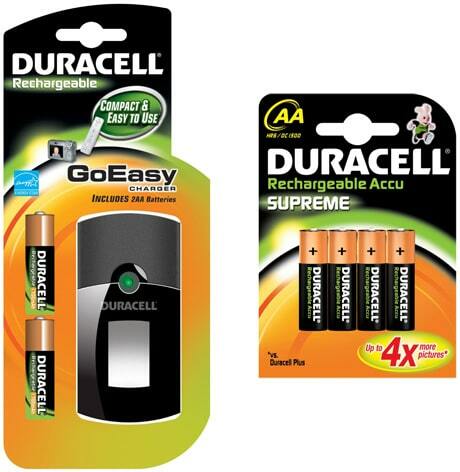 The charger itself comes with two 1700mAh AA batteries however with this offer you get an additional pack of Duracell Supreme 4 x AA Rechargeable Batteries for only £13.99 inc VAT! The Duracell GoEasy charger is a modest charger that can integrate well with the lifestyles of many. Suitable for charging batteries for anything from Wii remotes to cameras or simply TV remote controls, the GoEasy charger is capable of charging two AA or AAA batteries simultaneously, with average charging times landing between 8 and 10 hours. Being the modest charger it is at an amazingly low price, it’s no surprise to see that the Duracell GoEasy charger comes with built in overcharge protection (with charging times in the hours, this is a must have feature to protect your batteries), yet Duracell have also went one further with the easy charger and included a sensor which terminates charge based on a built in timer, meaning you can rest easy knowing your batteries are going to be safe and fully charged when you get back to them. After reading the above you may decide that you want some additional batteries to go with this charger and if this is the case you can check out our Duracell Rechargeable Batteries Range on our Online Shop. If you decide that the Duracell GoEasy Charger is not for you why not check out our Duracell Battery Chargers Range.